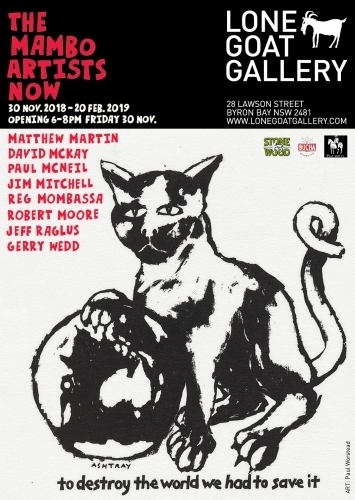 Join Dare Jennings and artists David Mckay, Paul Mcneil, Jim Mitchell, Robert Moore, Gerry Wedd for this historical round table discussion on the origins of Mambo and ongoing plans to destroy the world. MAMBO rose out of the early 1980’s Sydney post-punk scene, founded by Phantom Records visionary entrepreneur Dare Jennings. Drawing on the talents of self-taught outsiders, muso-slash-visual artists, poster & comic artists and refugees from the Yellow House, Mambo was more an art movement than a clothing brand, built on a foundation of subversive satire, vernacular appreciation, music, surf and politics.